Audio Technica reveals updated ATH-MSR7SE headphones | What Hi-Fi? Audio Technica's ATH-MSR7 headphones are back, and now they're even more special. The ATH-MSR7SE is the 'special edition' version - Audio Technica says audio performance has been enhanced, along with a new finish and improved sound isolation. Let's start by looking at the looks. 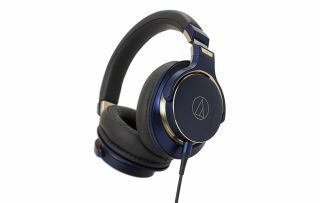 The aluminium housings now have a deep metallic navy finish with gold accents, while the earpads have faux-leather wrapping for greater comfort. But what about sound quality? Well, Audio Technica says it has improved performance by incorporating tech from its wired ATH-SR9 headphones. The 45mm drivers have a new carbon-coated diaphram for increased rigidity, faster repsonse times and reduced distortion, which will (in theory) result in more precise audio reproduction. There's also a new 6N-OFC cable, featuring in-line controls and a microphone. If this has tickled your fancy, the ATH-MSR7SE will be available in October, priced at £300.